You spend your hard earned money to pay for a trip to a far away place where no one really knows English just to wait in line to buy a ticket and when you finally get in you find that famous painting you heard so much about is faded, dull and chipped, it looks terrible by today's digital standards. Fear not as today I will teach you the secrets of restoring these old "masterpieces" from dull and lack luster to the way they should have been in the first place that is if the painter had had any proper art school training. Clearly in those days they never heard of the rule of thirds. At first I wanted to crop the image to make the subject Jesus conform to the rule of thirds. But then I realized I could not do a very nice roll over if the before and after images were of different sizes, besides cloning out the odd arms would be far too much work. So instead I opted to use selected focus. Using selected focus allows me to draw the viewer's eyes directly to the subject clearing up all those busy distractions that make the eye wander about. What was the artist thinking wasting his time on all those unnecessary details? 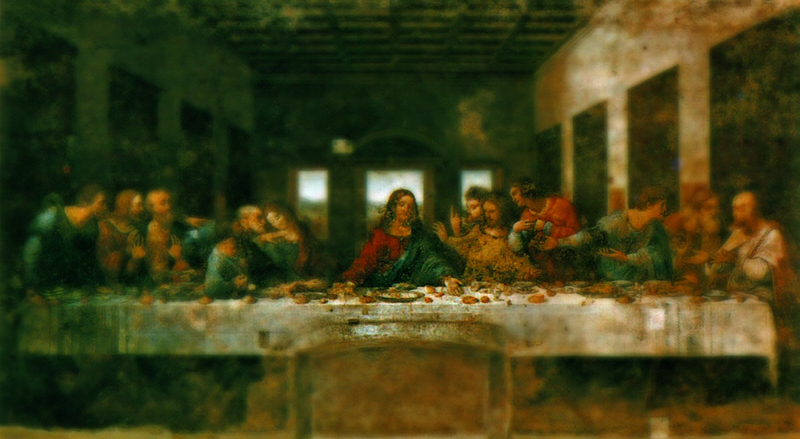 Selective focus also gives the painting a depth of field and 3 dimensionality that the original lacked. To increase the feeling of magic and fantasy and to repair the chipped paint I applied an Orton Effect filter/action. The Orton filter I applied came with a set of 10 other actions which I purchased from WeripUoff at only $180. I highly recommend them as they save you a lot of time learning stuff. Then to give it a more modern update look I applied a cross processing action (good value at only $80 from WeripUoff). Noticed the richness of colour. The hills in the background window are now a pleasant shade of Irish green. Still it didn't quite pop so for the final touch I applied a subtle single image auto HDR tone mapping, notice how much better the light is on Jesus' robes when compared to the original. A bit expensive at $260 for the HDR package from WeripUoff but how can you be state of the art without the latest and best tools. Also consider the money you are saving and the disappointment you are avoiding by not travelling to view the original artwork.